Sure, this 2,000 square-foot, no-windows, no-view property is a bit of a fixer-upper. But think of the Halloween parties you could throw down here! This set of 200-year old tunnels beneath the British port city of Plymouth are going up for auction next month for the low-low price of $30,590. The three 60-foot tunnels were originally built as moats around a military fortification in the early 19th century. Apparently, in one section you can still see where drawbridge used to rest upon a series of stones. During the Napoleonic Wars, the moats were enclosed and served as secret prisons for captured French soldiers, when the British military wanted to keep the horrors of war far away from local residents. A century later, during World War II, the tunnels were used as air raid shelters. 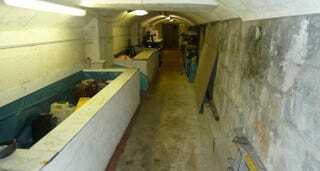 Kevin Tapper co-owns the tunnels with his brother, which have been passed down in their family since they purchased them from the Ministry of Defence in the 1950s. Their grandfather, who was a fisherman, used to store his boat in the tunnels. Later the family used them for storage, but they've been hard to maintain due to their inaccessibility, he told the Plymouth Herald. "We weren't doing anything with them and because of their location they need a lot of attention so we've decided to move on now." The property is cheekily listed as a "0 bedroom, investment property," with no vehicular access, by Bradleys Estate Agents, which suggests that the new owner might want to use them for a workshop, storage or "personal recreation."